The classic children s song Shabbat Shalom, Hey! is now an illustrated story, new from Kar-Ben. Join a lion as he searches for his jungle friends. 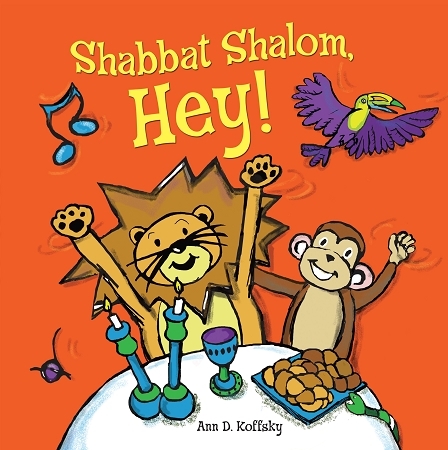 Children can identify the preparations for Shabbat, such as candles and challah, as the lion s friends slither, swing, and fly by with them. Listen to the song, as sung by Mark Bloom and the children from Gan Shelanu Preschool, through a QR code on the back of the book! "Koffsky's vibrant cartoonstyle artwork is well suited to the celebratory atmosphere of this weekly observance. The colorful animals stand out against vivid background hues, and the decision to place the artwork at a 90-degree rotation from standard page turns allows for impressive vertical spreads that can be easily viewed in a group setting."